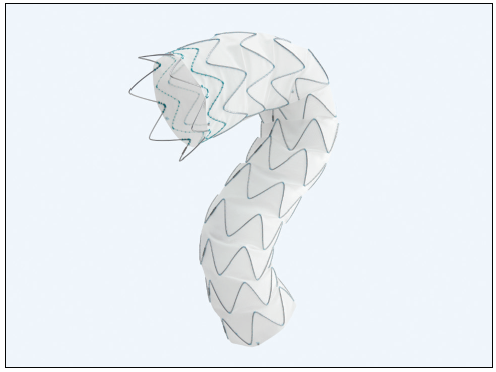 An overview of the enhanced features of this next-generation thoracic stent graft system and an illustrative case report demonstrating its utility in practice. Degenerative diseases of the thoracic aorta are frequently seen in older patients with significant atherosclerotic disease, including iliofemoral calcification and tortuosity. Severe access vessel or aortic tortuosity can cause difficulty reaching and accurately deploying a stent graft at the intended target site and is also associated with increased risks of vessel injury and endoleak due to lack of conformability. Patients with small femoral or iliac arteries frequently require open surgical access or adjunctive procedures, such as retroperitoneal iliac exposure and conduit placement to accommodate large-bore access. In older patients, percutaneous femoral access is associated with less need for general anesthesia, shorter hospital stays, and enhanced recovery. The ideal thoracic endovascular aortic repair (TEVAR) device will have lower-profile access with improved trackability and high conformability to provide safe, accurate deployment with resistance to endoleaks. Figure 1. The Valiant Navion™ lower-profile delivery system. Figure 2. The FreeFlo device configuration. Figure 3. The CoveredSeal device configuration. Medtronic’s Valiant Navion™ thoracic stent graft system (Figure 1) is a lower-profile evolution of the company’s Valiant™ thoracic stent graft with the Captivia™ delivery system. The Valiant Navion™ system has a reduced delivery system profile of up to 4 Fr, with outer diameters of 18, 20, or 22 Fr and a working length of 93 cm. The system has two proximal device configurations: FreeFlo and CoveredSeal. 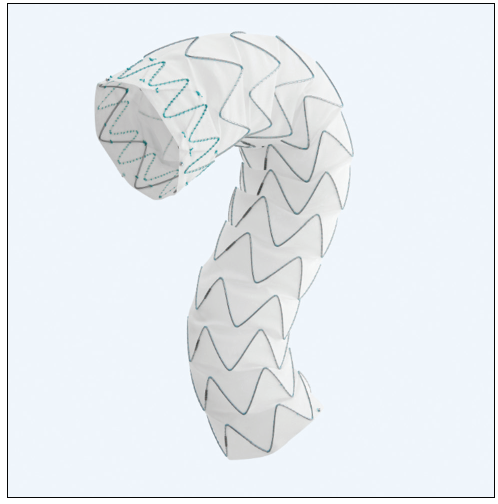 The FreeFlo device offers a proximal bare stent with tip capture (Figure 2). The new CoveredSeal device is also a proximal configuration with no bare metal extending beyond the proximal graft fabric edge and offers the accuracy and precision of tip capture (Figure 3). Physicians can now choose the desired proximal device configuration for varied anatomies. The Valiant Navion™ catheter assembly has iterative improvements upon the flexibility and trackability of the Valiant™ Captivia™ system, facilitates vessel access with hydrophilic coating, and includes a shorter tapered tip. A 60-year-old man presented with a 6.3-cm fusiform descending thoracic aortic aneurysm and had a significant medical and surgical history, including hypertension, congestive heart failure, coronary artery disease, chronic obstructive pulmonary disease, and previous coronary artery bypass grafting. On CT imaging, it became apparent that this patient also had severe descending thoracic aortic tortuosity and would require TEVAR deployment in zone 3; the severe tortuosity combined with the need for an accurate distal arch landing presented a challenging scenario. The proximal landing zone measured 40 to 41 mm in diameter with a 20-mm seal length, and the distal landing zone measured 36 mm in diameter with a 20-mm seal length. The distal margin of the endograft was targeted to land approximately 20 mm above the celiac artery with total aortic coverage of approximately 320 mm on the centerline. The access vessel diameter was measured at 7 mm. Due to existing comorbidities as well as patient preference, it was decided to treat this patient endovascularly with TEVAR, and the patient consented to participate in the global investigational device exception clinical trial for the Valiant Navion™ thoracic stent graft system. Main body access was achieved through a right-sided standard percutaneous technique. 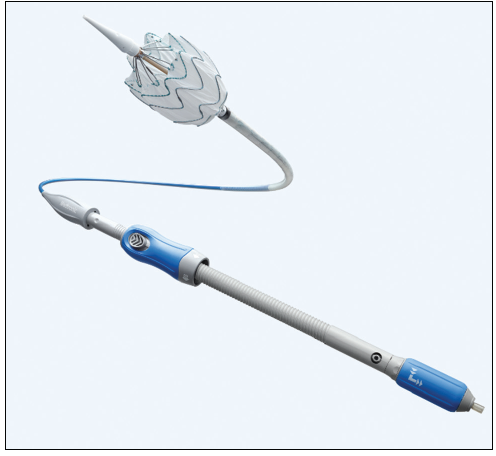 A 260-cm double-curved Lunderquist® wire (Cook Medical) was placed with the tip of the wire at the level of the aortic valve. A 5-Fr, 100-cm angiographic marker pigtail catheter was advanced via left common femoral artery access. Aortography was performed and revealed aortic arch landmarks as well as severe thoracic aortic tortuosity, which included several hairpin turns, even with the stiff guidewire in place (Figure 4A). Passing catheters and wires around these turns was very challenging. After identifying and marking the proximal seal zone, the first device, (a 46- X 40- X 185-mm FreeFlo configuration) was introduced over the stiff wire and advanced into the descending thoracic aorta. Due to the severe thoracic aortic tortuosity, significant resistance was encountered at the location of the mid-descending thoracic aorta, and therefore, a buddy wire was introduced with the intent of straightening the severely tortuous anatomy. Even with the buddy wire in place, severe tortuosity remained, and a decision was made to deploy this first TEVAR device into the mid-descending thoracic aorta in an effort to facilitate the delivery and deployment of a more proximal device by straightening the most severe hairpin turn in the aorta. Figure 4. Preoperative 3D CT reconstruction showing aortic arch, visceral landmarks, and severe thoracic aortic tortuosity, including several hairpin turns (A). 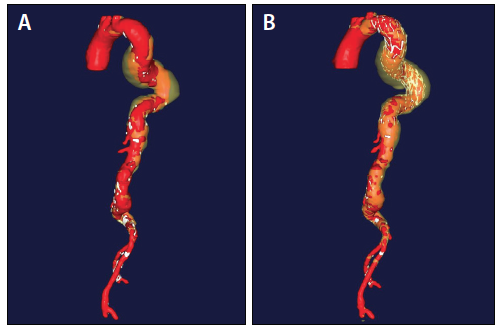 Postoperative 3D CT reconstruction demonstrating successful exclusion of the thoracic pathology within the severe natural tortuosity of the aorta (B). After successfully deploying the first device in the mid-descending thoracic aorta, a second TEVAR device (a 46- X 46- X 103-mm FreeFlo configuration) was effectively delivered to the intended proximal landing zone and precisely deployed at the distal margin of the left subclavian artery. Two CoveredSeal configurations (46 X 40 X 200 mm and 46 X 46 X 218 mm) extended the repair distally to the intended landing zone, approximately 20 mm above the celiac artery. Proximal and distal seal zones, as well as TEVAR device overlaps, were ballooned as recommended. The final aortogram revealed precise placement of the grafts at the proximal and distal seal zones and effective exclusion of the thoracic pathology with no evidence of endoleaks (Figure 4B). The patient’s course of stay in the intensive care unit included successful weaning from mechanical ventilation, with extubation on postoperative day 0 and discharge in a stable condition on day 6. Despite extreme tortuosity, the aneurysm was successfully managed with a totally percutaneous technique. The device was able to navigate the tortuosity without requiring externalization of the aortic wire (ie, “body flossing”) and maintained stable position with a predictable and intuitive deployment. There was a high degree of conformation of the Valiant Navion™ stent grafts to the multiple severely angulated curves of the thoracic aorta. Due to the novel manufacturing innovation by which the Valiant Navion™ stent graft is mounted onto the delivery catheter, the device does not shorten or significantly change length, allowing for very accurate placement at the intended proximal and distal landing zone without the need for repositioning during deployment. The Valiant Navion™ thoracic stent graft system, which received FDA approval in October 2018 and CE Mark approval in November 2018, is indicated for the endovascular repair of all lesions of the descending thoracic aorta in patients with iliac or femoral artery access vessel morphology that is compatible with vascular access techniques, devices, or accessories. Disclosures: Consultant to Medtronic Aortic. • nonaneurysmal aortic distal neck length ≥ 20 mm for FreeFlo and CoveredSeal configurations for fusiform and saccular aneurysms/penetrating ulcers. • The long-term safety and effectiveness of the Valiant Navion thoracic stent graft system has not been established. All patients should be advised that endovascular treatment requires lifelong, regular follow-up to assess the integrity and performance of the implanted endovascular stent graft. Specific follow-up guidelines are described in the Instructions for Use. Of note, patients with specific clinical findings should receive enhanced follow-up. • The Valiant Navion thoracic stent graft system is not recommended in patients who cannot undergo, or who will not be compliant with, the necessary preoperative and postoperative imaging and implantation procedures described in the Instructions for Use. • The safety and effectiveness of Valiant Navion thoracic stent graft system has not been evaluated in certain patient situations and/or populations. Please refer to product Instructions for Use for details. • Strictly adhere to the Valiant Navion thoracic stent graft system sizing configurations and guidelines as described in the Instructions for Use when selecting the device size. The appropriate device oversizing is incorporated into the sizing guidelines. Sizing outside of this range can potentially result in endoleak, fracture, migration, infolding, or graft wear. • Never use a balloon when treating a dissection. Please refer to the product Instructions for Use for details. • MRI may be used on the Valiant Navion thoracic stent graft only under specific conditions. It can be scanned safely in both 1.5T & 3.0T MR systems under certain conditions as described in the product Instructions for Use. For additional information regarding MRI please refer to the product Instructions for Use. • Intramural hematoma; Leg edema/foot edema; Loss of patency; Lymphocele; Myocardial infarction; Neck enlargement; Nerve injury; Neuropathy; Occlusion - Venous or Arterial; Pain/reaction at catheter insertion site; Paralysis; Paraparesis; Paraplegia; Paresthesia; Perfusion of the false lumen; Peripheral ischemia; Peripheral nerve injury; Pneumonia; Postimplant syndrome; Post-procedural bleeding; Procedural bleeding; Prosthesis dilatation; Prosthesis infection; Prosthesis rupture; Prosthesis thrombosis; Pseudoaneurysm; Pulmonary edema; Pulmonary embolism; Reaction to anesthesia; Renal failure; Renal insufficiency; Reoperation; Respiratory depression or failure; Retrograde type A dissection; Sepsis; Seroma; Sexual dysfunction; Shock; Spinal neurological deficit; Stenosis; Stent graft migration; Stent graft misplacement; Stent graft occlusion; Stent graft rupture (for example: holes, tears); Stent graft twisting or kinking; Transient ischemic attack (TIA); Thrombosis; Tissue necrosis; Vascular ischemia; Vascular trauma; Wound dehiscence; Wound healing complications and Wound infection. • Please reference the product Instructions for Use for more information regarding indications, warnings, precautions, contraindications and adverse events.